The previous version had translation between 90 languages. The newest one also has a Word Lense. You just point your phone to a sign or text and it will instantly translate the text, even without Internet/data connection. Currently available in: English to French, German, Italian, Portuguese, Russian, Spanish. Similar to Google Glass, though these glasses offer augmented reality through holograms. Which is a step further than other personal viewing devices. The release is taking advantage of Glass being recalled back to the drawing board. Recently fully, and then some, funded via Kickstarter, these are one of the most innovative earphones to hit the market. 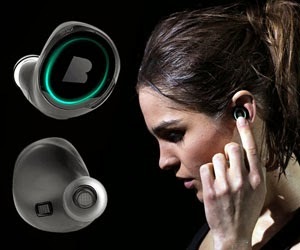 They are small, fit right into your ear with no wires whatsoever. They are also compatible with multiple devices, waterproof, shockproof, have noise canceling technology, and also act as health and fitness tracker via app.